In reading that Sydney is going to get a “retro game-themed” bar called Spawn Point, I discovered that the Melbourne-based Mana Bar had closed in September last year. Ben Mudie, who’s named as the founder of Spawn Point, made the comment that the Melbourne Mana Bar had closed “due to tight liquor laws not making it viable“. If Mudie thinks the Melbourne Mana Bar closed because of liquor licensing restrictions, he’s missing a lot of important information. The reason that the Mana Bar franchise – which still operates a venue in Brisbane – became even vaguely known in gaming circles was due to one of its owners, Ben “Yahtzee” Croshaw. His popular Zero Punctuation episodes had made him a recognisable gaming figure, with this association leveraged to the hilt by another co-owner Guy ‘Yug’ Blomberg. You can read a version of the birth of the Brisbane Mana Bar here, but before you click, recognise that Yug is the main source for that story and the man loves to talk his achievements up. Before we go on to the issues with the Melbourne Mana Bar, it’s worth noting that the most visible original owners of the Mana Bar appear to have sold the business to others – Yahtzee is mentioned as a ‘former owner‘ and Yug lists himself as a previous co-owner of the venue. (Other founding owner Pras Moorthy appears to be the current Managing Director of the Brisbane Mana Bar.) Even when they were the owners, I don’t believe these guys managed the Melbourne Mana Bar on a day-to-day basis – that was done by someone else. I went to the Melbourne Mana Bar three times, the first in late 2012 and the other two in 2013. Each time I thought about writing it up, but didn’t because I was trying to avoid writing something unfairly negative. Perhaps I’d just gone on a quiet night. Several times. Melbourne Mana Bar was located on Brunswick Street in Fitzroy. Not to put too fine a point on it, but there are a huge number of bars, pubs and other hospitality venues in Fitzroy. The Mana Bar was a small bar among many other drinking venues, catering to the niche group of gamers who wanted to drink, or drinkers who wanted to game. The following is based on my potentially faulty recollections. Above I said I visited the Mana Bar three times in Melbourne. It was almost four, but on my first attempted journey I found out that the Mana Bar opened at 3pm and closed at 11pm. It was about 10.30pm when I found this out and was too far away to make it to Fitzroy before closing time. In articles about why the Melbourne Mana Bar closed, the managers pointed to the 11pm closing time as a major problem, but this appears to have been the same closing time right from the start. Mana Bar opened a small venue in order to have a cheaper rent and lower licensing fees, but this also meant there were more restrictions on opening hours. Anyway, to make a long story short: I didn’t go that night. Having learned my lesson, I went earlier on a Thursday evening to the Mana Bar late in 2012. 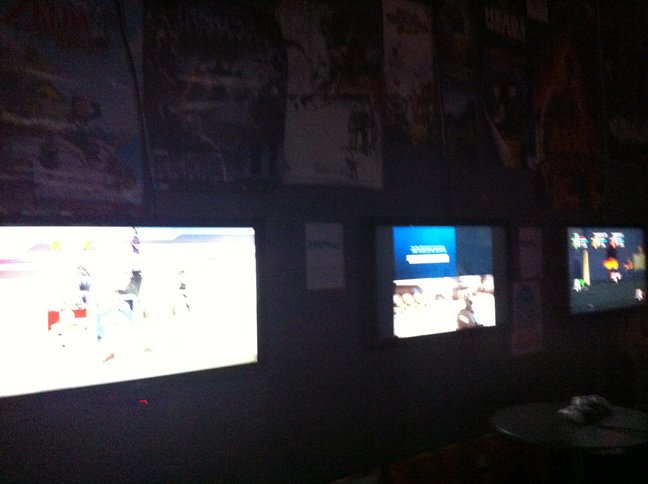 It wasn’t that easy to see inside, so I opened the door to find five or six screens up on the walls, games on display. Each game was taken up by one or two people, perhaps with one additional observer, but all games were certainly occupied. It’s been too long for me to remember what the games were, but I hadn’t played any of them. This was a barrier – if I wanted to play, I already had to go up to a stranger and see if they’d be interested in sharing the game. But having never played that title, at best I’d be learning as I went, at worst a hinderance. Plus alcohol. It could all get messy very quickly. Another problem with small spaces plus multiple games is that you don’t get a lot of space to move. The gaming seats were already set back a short way so that players could comfortably see the TV screens, so that the ‘walkway’ down the middle of the room wasn’t that wide, even with just a few spectators standing in that path. Past this front area (which included the bar) there was a middle room and then an outdoor area. Both were empty of people. I went back to the bar, bought a beer and watched a game for a while. No-one was moving from their chosen game (apart from the odd swap between player and spectator-they-already-knew) so I gave up. There were other places in Fitzroy that I could stand around and be useless in. Having finished up whatever I was in Melbourne for in early 2013, I was already a bit drunk by the time I got to the Mana Bar. I thought I’d give the place a second chance. It was a Friday night. The story was pretty much the same. I’d played a few of the games that night (Mario Kart for one) and recognised other games like Castle Crashers and Battlefield / Call of Duty / whatever, but the deja vu was otherwise strong. The places was only lightly sprinkled with people, but they occupied all the gaming platforms. Again, the middle room and outdoor areas were empty (although I thought the Pikachu picture out the back was new). It’s of concern when the most entertainment I got from the Mana Bar that night was in the toilets. 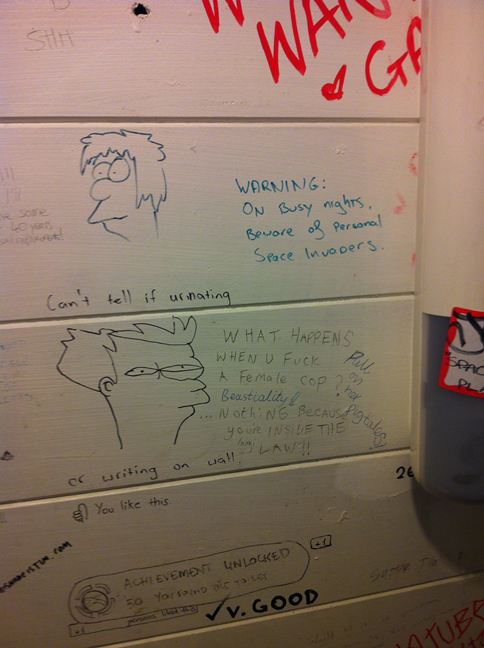 People had obviously taken some time to create a range of gaming- and nerd-inspired toilet graffiti on the walls. It wasn’t the Louvre, but hey, I’ve seen much, much worse scrawled on walls. Back to the bar with a slightly pricey cider in hand, things played out as before. Those people playing the games didn’t really move from their seats, or appear to drink much either. I happened to glance over the bar where I thought only a woman was working, only to see a man wearing earphones briefly rise into view before disappearing again. For a moment I thought he must have been the DJ, but it quickly dawned on my that no, he appeared to be playing games on a PC behind the bar. Or was doing something on a PC that required earphones and a lot of his attention. He certainly wasn’t serving customers… not that there were many to serve. I left at around 11pm. Even if someone there had finished their game, I wasn’t going to have any time to play it before Mana Bar closed for the night. Maybe I’m an optimist, or a glutton for punishment, or truly lacking something to do in Melbourne that time, but I again turned up in Fitzroy sometime in early 2013 to go to the Mana Bar. I was only about a step through the door when it struck me that I was faced with the same issue of a smattering players who didn’t fill the room but were across all the games. Compared to the noise and bustle that was other parts of Fitzroy that night, Mana Bar was again relatively quiet, a bit dingy and – dare I say it – unwelcoming. It was probably about 10 seconds before I turned around and left. I’d felt it on the second visit, but the third time crystallised it for me – there’s a problem when you try to mix bars and gaming, because what is drawing the customers? If it’s the games, then you need to have enough of them for customers to play. Games require space, which is an issue in an already small location – every square metre taken up with games is space that a customer can’t stand. 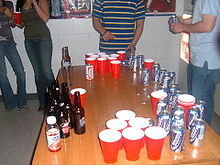 If you’re trying to attract drinkers through the booze you offer, then you run into a whole set of new challenges. Mana Bar did try to offer cocktails as something of a draw card – you can see the original list here – but it lacked the vibe for a good cocktail bar. Fitzroy was filled with places to get a cocktail and there were better places for people watching. All in all, it felt that Melbourne’s Mana Bar was staggering under the dual weight of not being a good place to game and not being a good place to drink. Maybe it could have been a good place to meet friends, but there were other much better locations just across the road (or down the street, or around the corner…). This is why I saw blaming the liquor licensing restrictions as extremely simplistic. It’s very easy to do and takes the responsibility off the owners / managers, but it ignores some pretty key points, such as Melbourne Mana Bar lacking a worthwhile draw card to begin with. After all, there was plenty of time before 11pm that people could have been coming in for drinks, potentially using Mana Bar to start the night before moving off elsewhere. Other small bars around Fitzroy certainly appeared busier at the same time of night. Melbourne Mana Bar certainly started out with a lot of goodwill, but over time that appeared to drain away. Sure, the first time the 11pm closing time got me, but I wanted to visit the Melbourne Mana Bar as a destination so I arrived early. It was the other things about the venue that drove me away from it. The Brisbane Mana Bar appears to have kept its patronage by constantly running events and attractions, although I haven’t visited that venue so I can’t say anything about its layout or atmosphere. Maybe it has some natural advantages the Melbourne version lacked. It’s easy to sell the idea of a venue that mixes alcohol with gaming, given that a lot of people enjoy those two activities in isolation. Mixing them, however, seems to potentially dilute the best parts of each. It will be interesting to see if Spawn Point – and other gaming-oriented bars that are being planned – manage to survive, or if it runs into the same issues that saw the Melbourne Mana Bar close its doors. I know this is a bit old, but just wanted to add my two cents. The Melbourne Mana Bar – and I never actually made it inside the venue before it closed – but from what I’ve seen and heard from those who frequented the place, it did appear to be mismanaged. The core problem: that nobody running the place actually cared about it that much, so the bar was just on “auto-pilot”. This is a big problem, especially for weeknights where you need something to draw people in. On weekends, would the 11pm license restriction have been bad for business – DEFINITELY. No question. Could it have been worked around – possibly, and who knows for certain but I don’t see any evidence that management really tried. I’m really curious to see how Spawn Point goes. Sydney is a tough market (more cynical than Melbourne) but in the right place, it might work. In the wrong place it will fail terribly. I’m not that familiar with Spawn Point’s address, but it is at least in the centre of the city so that’s a good sign. But as with Mana Bar (the one still open anyway) it really needs to be easily accessible as part of a broader night out, and marketed that way if it wants enough business through the door to actually make money. This kinda thing just doesn’t work as a destination unto itself, because gamer nerds hogging consoles for six hours is not a viable business – as you can attest to. Their floor plans seem to have the right idea, and I think the retro aspect will get a lot of interest at least initially. We’ll see. But I can’t wait to check it out. God this was a long comment, sorry. It’s not that old a post 🙂 And no problem about long comments about my blog posts – it’s a nice change to all the spam. A big part of my gaming background came from being in arcades, so I’m not totally shy about asking to come in on someone else’s game. However, I usually liked to know that I could play the game first, which wasn’t the case with the available games (as in one space free) at Mana Bar the times I went. However, unlike arcades, no-one was leaving the game they were playing, so there wasn’t even the opportunity to switch in. Brisbane Mana Bar might indeed be a nicer place and friendlier to those in the bar. In any case, I think there’s an issue that anyone trying to create a ‘gaming bar’ has to deal with, and that’s working out if they are looking for gamers who drink or drinkers who game. There’s a lot more potential money in the second group, but that group also has a lot of other bars they can go to if they want booze more than playing some video games. I think such bar would need more casual games like those of old arcade coin machines, which would make people switch often, so they could get a chance to buy that drink or beer. And space is certainly needed. I had those experiences too. I was certain that some arcades would hire a guy who was so great at a game to show off the special moves so that I’d then pile in coin after coin in an attempt to reach the same place. And I agree about the game type in bars – if you want people to drink AND game, you need to have games that provide their own breaks.